Quick check caps A preventvie solution to the refrigerant tampering and huffing. Quick check caps a preventive solution to the refrigerant tampering and huffing. J Flow Products a nationwide manufacturer of innovative products for the air conditioning industry, announced the debut of the tamper resistant locking refrigerant caps Quick check cap gauge to prevent refrigerant tampering and huffing it come with a tamper resistant screw. It's unique bit key prevents unauthorized access to the refrigerant in the air conditioning unit. The unique bit key is only sold to certified air conditioning techs and only at air conditioning supply distributors. 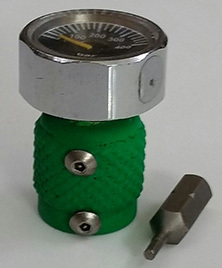 The quick check caps comes with a rubber color coating paint and a cap to protect the mini gage from the elements and to identify the refrigerant in the air conditioning unit to prevent mixing of the refrigerants. Quick check caps is a quick way to check the refrigerant charge in the unit, prevents refrigerant tampering and huffing and meet code.